At Korando Heating & Cooling we believe that you should know all your heating options available before investing in a system for your home, and fireplaces are one of those options. 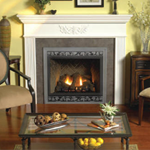 Our experts can install both wood and gas fireplaces which come in a variety of designs to best suit your home. Whether you're looking for a new fireplace installation or fireplace maintenance, please call Korando Heating & Cooling to ensure your fireplace is being serviced by an expert.